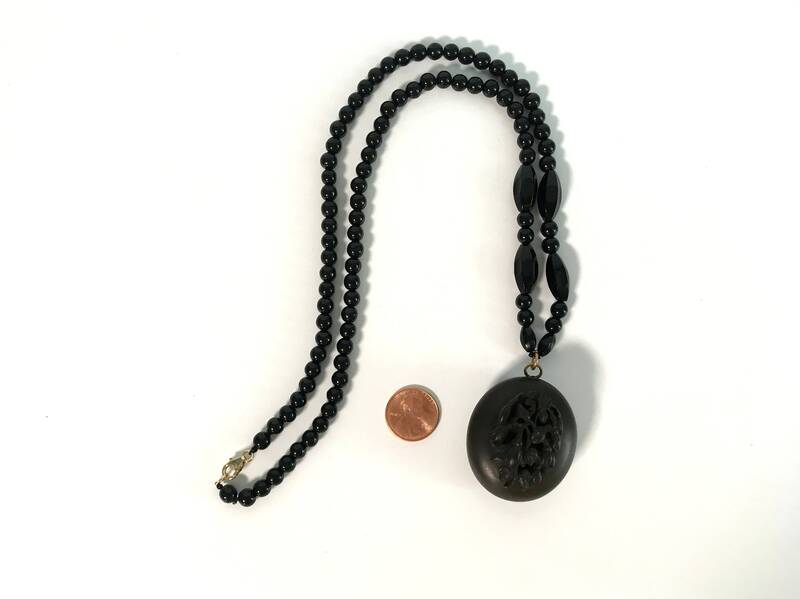 An antique locket that is Gutta Percha on an antique French Jet beaded necklace. 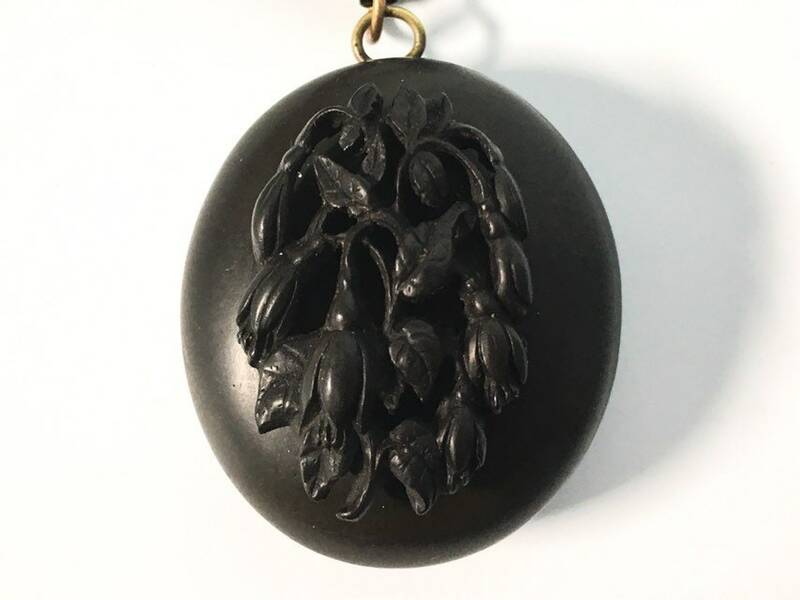 This large oval locket from the 1800s features a gently flowing raised bouquet of drooping blossoms and leafy flowers on the front. The locket hangs on an antique French Jet beaded chain with a 14K gold filled clasp. Gutta Percha is made of the resin from trees in Southeast Asia. It is brownish-black and is molded rather than carved. Gutta Percha was first used circa the 1840s for jewelry. French Jet was made beginning in the early 1800s. Is is a type of glass that was manufactured in France. French jet was used in modestly-priced mourning jewelry. 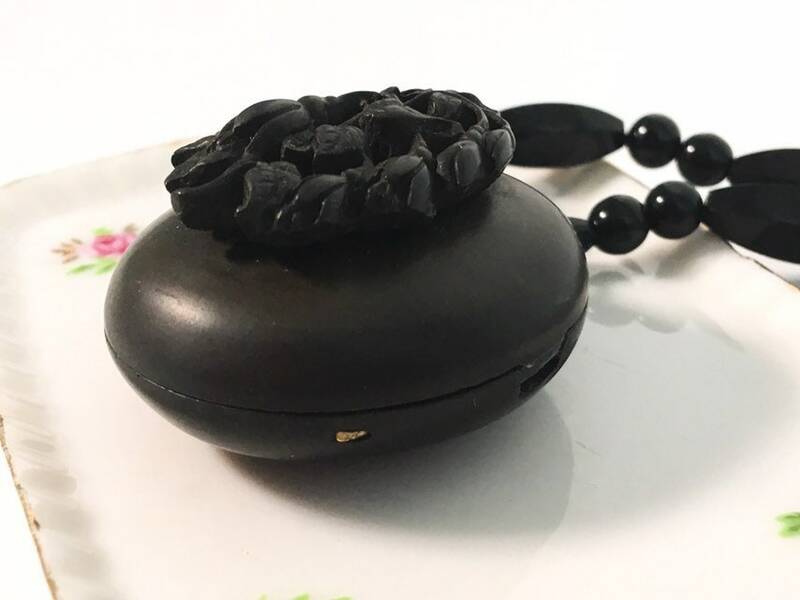 This type of Mourning locket usually held a memnto of someone who had passed on - often a lock of hair. The locket is a rather large and deep (thick) oval. The top has a cluster of flowers buds that seem to hang their heads in a melancholy design. Inside the locket there is a decorative surface. 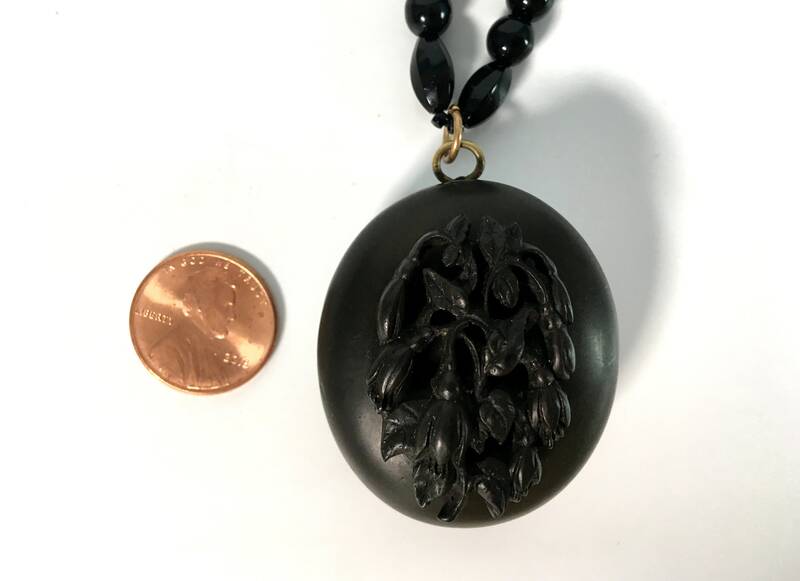 The color of the locket is a dark brownish black. The back of the locket is plain with no decoration. The locket stays closed as the two halves are a tight fit. The locket has a hinge on the right side side and it can be opened with care from the left side - see NOTE below about this. 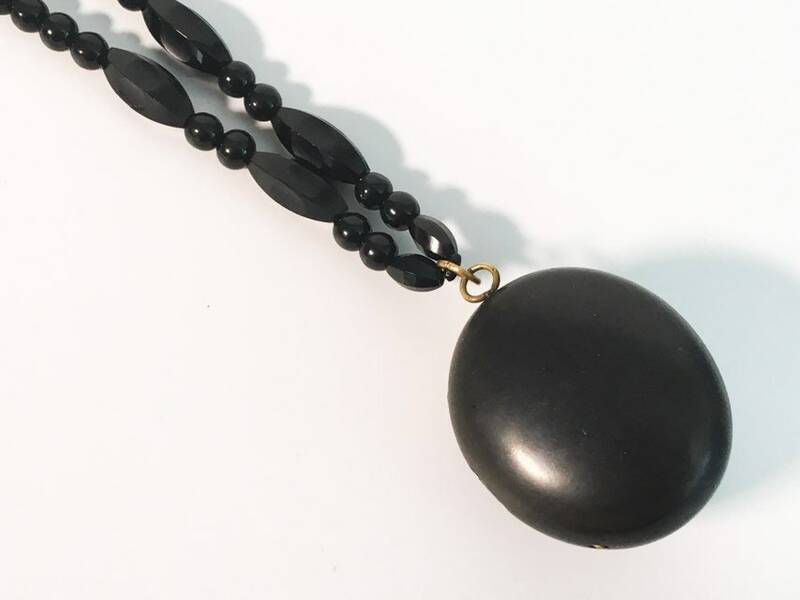 The recently re-beaded chain is made of both round and cylindrical French Jet beads strung on black silk cording. 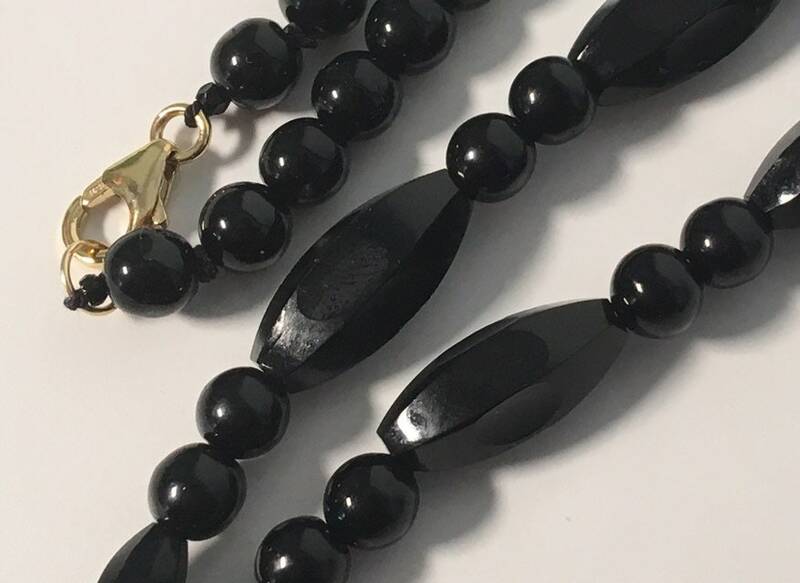 The beads are a glossy black. The lobster clasp on the back is 14K gold filled and is stamped on the inner section. 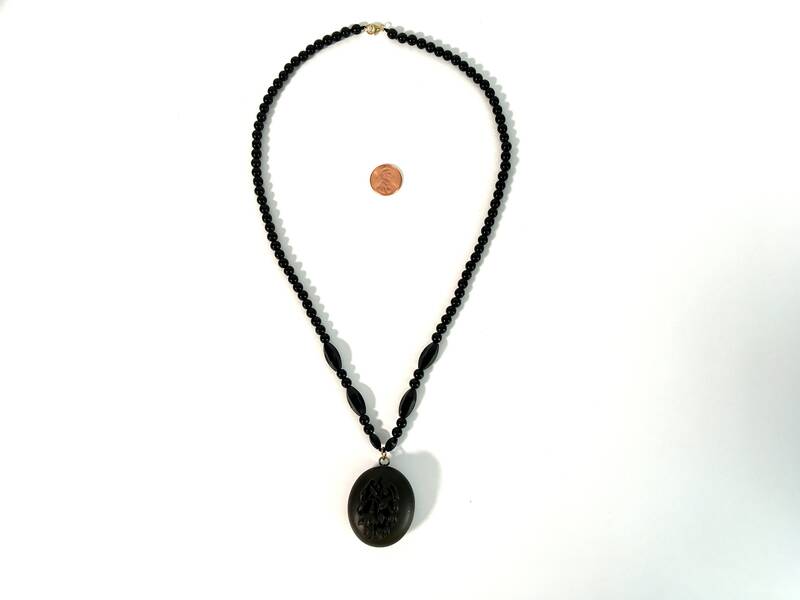 While the clasp can be used, this beaded locket necklace does fit over the head - it is 24” in length. Locket - 1 3/4" long (including bale) and 1 1/4" wide. It is about 3/4" deep. The antique locket and beaded necklace is in nice antique condition with wear commensurate with its antique age. 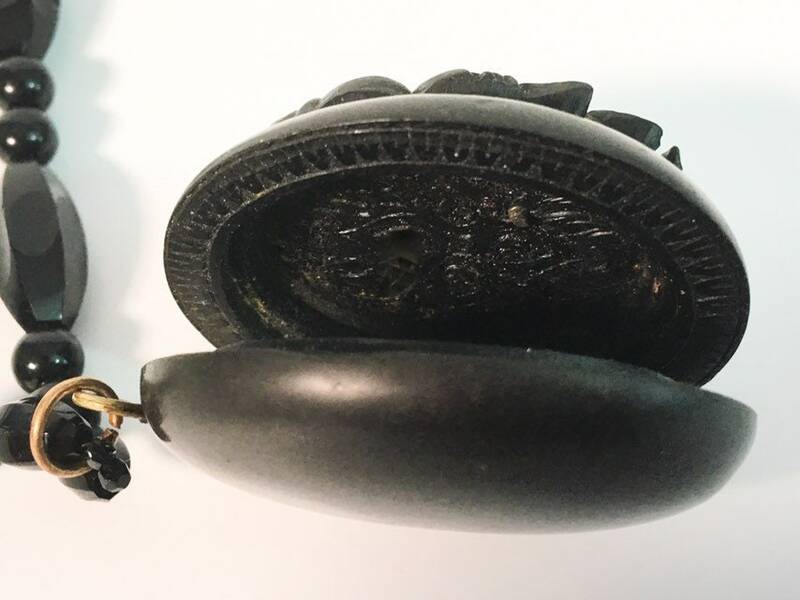 A bit of a gold colored metal used to shape or mold the oval Gutta Percha locket can be seen on the right side of this locket. See photos for detail. NOTE: This locket hinge is delicate. The hinge has been repaired and the jeweler advised that if opened, it should be done very gently and NOT be opened up all the way in order to keep the hinge intact. It does open enough (about 1/2" wide) to be able to put an item inside if so desired. 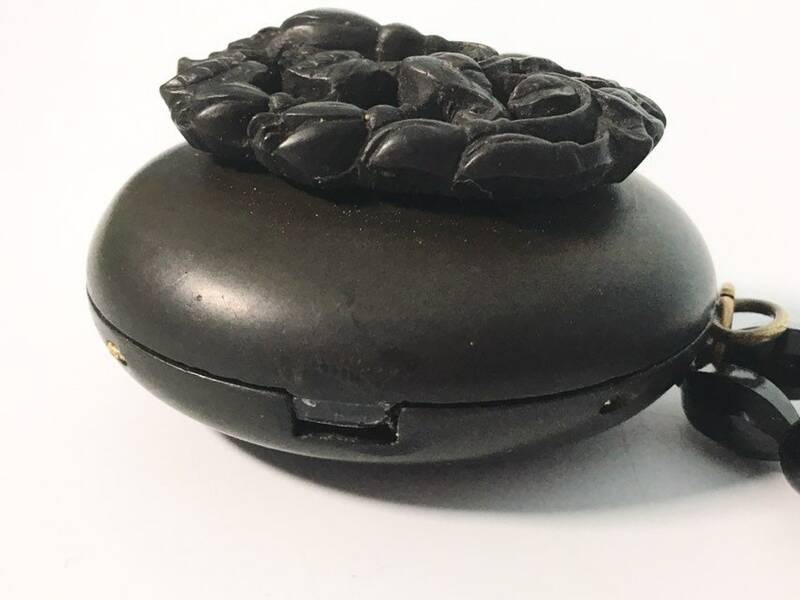 Basically, mourning jewelry was a way of keeping your dead loved ones near you and often included a lock of their hair. Mourning jewelry was commonly worn from about the late 1830s to about 1900. 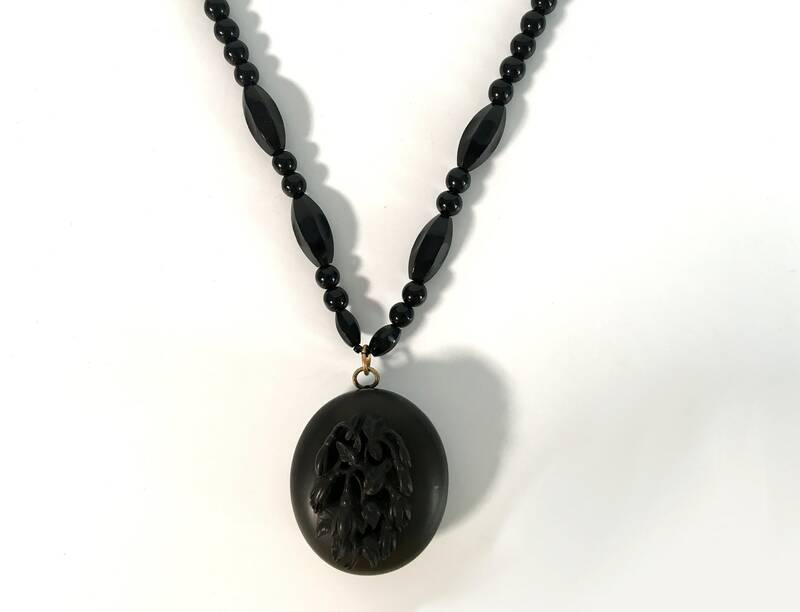 A woman was supposed to wear black for a designated period of time and this type of black jewelry was acceptable to be worn during this time.